Every time I pop in one of my Indiana Jones DVD’s, and begin enjoying his adventures again, one of the thoughts the comes to mind is “man, I wish there were more of these movies.” Rumors of a fourth installment have been going around since the release of “Last Crusade,” but it was only a few years ago that we learned there really would be another installment. The general reaction to this news by the fan community was not kind. George Lucas, producer/creator of Indiana Jones, has not proved himself a reliable filmmaker; the Star Wars prequels were just terrible. Steven Spielberg hasn’t been churning out classics like he used to (though he’s had a few gems this decade) and Harrison Ford hasn’t had a truly great role in a long time. There wasn’t really anything to tell us that a fourth Indy movie would be a great idea. But the trailers have been awesome, and reception from Cannes was generally positive, and I couldn’t help but get worked up. No matter how I tried to keep my expectations in order, I was unbelievably excited to see the new film. The last time I was this excited to see a movie, it was Spider-Man 3 last May, and that film didn’t come close to reaching my expectations. But Indiana Jones and the Kingdom of the Crystal Skull surpassed them. My big worry about the movie was that, even if it was a good film by its own rights, it wouldn’t feel like an Indiana Jones adventure. The easiest way to sum up my praise for the film is that it is a 100 percent Indiana Jones film. At times, it felt like I had plucked a DVD I never knew existed out of my Indy-DVD-box-set, and was projecting it on the big screen. 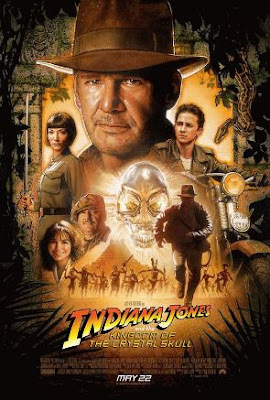 The plot, the action, the acting, the directing, and the music all reek of Indiana Jones, and it simply rocks. This is mostly due to Harrison Ford, who after 19 years hasn’t forgotten how to play the role. I watched “Last Crusade” directly before leaving to see “Crystal Skull,” and his performances in the two films, separated by a gap of 19 years, were seamless. He’s aged; his face is wrinkled and his hair is grey, but that is the only difference about Indy between the first three films and the fourth installment. Ford’s recent performances have been without any real energy, his voice more or less expressionless and quiet. But in “Crystal Skull,” he darts around the screen like he’s thirty years younger, swinging from his whip and punching the crap out of every Russian he comes in contact with. Harrison Ford is simply one of my favorite actors, and the most gratifying part about “Crystal Skull” is to see him have so much fun in his iconic role. To me, he’ll always be Indiana Jones; the two names are synonymous. With “Crystal Skull,” he proves that this is the role that will define his career. The film has everything in place that made the first three films so great. Unbelievable action sequences, great humor, a complex but fun to follow plot filled with history, and a hero we love to root for. But “Crystal Skull” adds some new things to the tried-and-true formula to mix things up a bit, and it works very well, managing to bring more fun to the film. The film is set in 1957, 19 years after the events of “Last Crusade.” While the earlier films were set in the 30’s, and represented the era, “Crystal Skull” also represents the era, to great effect. The opening showcases a classic 50’s car, and plays some classic Elvis to go along with it. Early in the film, one of Indy’s retorts is “I Like Ike,” and the color scheme is brighter then the previous installments, giving it the feeling of 50’s cinema. The plot, which I will not divulge here, is more sci-fi oriented then the first three films, a trademark of 50’s cinema. I’ve been praising the plot throughout this review; it’s actually the one element of the film that will probably divide people as to whether or not they like the movie. Like I said above, I won’t divulge the basic plot, because it’s something that needs to be experienced. I didn’t know the plots of the original films when I saw them, and it made them so much more enjoyable. Like the trilogy, the plot for “Crystal Skull” is an experience each viewer needs to discover. But what I will say is that it is rooted in science fiction, but never gets too far-fetched. Remember, “Raiders” ended with exploding heads. This series is weird, and it knows it. The plot is full of history (like “Raiders” and “Crusade,”) and the fictional elements tie them together wonderfully. It’s a tad too confusing than it needs to be (“Raiders” and “Crusade” were always easy to follow) but it never really detracts from the experience. “Crystal Skull” makes you remember how much “The DaVinci Code” owes to the Indiana Jones series. None of the cast except Indy and his old flame Marion return for the latest installment, but forcing in old characters would have screwed up the plot. This time, Indy is joined by a greaser named Mutt Williams, played by Shia LaBeouf. I was somewhat skeptical about LaBeouf’s presence in the movie when I read about it, but this is by far the kid’s best role to date. He’s a great sidekick, and he and Ford have real chemistry on screen. Karen Allen returns as Indy’s original girlfriend, Marion Ravenwood from “Raiders.” She hasn’t seemed to age much, and remembers how to play the character. We rooted for the two lovers to get together in “Raiders,” and we root again in this film. Ray Winstone plays Mac, one of Indy’s WWII buddies, whose allegiance is questionable. John Hurt and Jim Broadbent have small roles as colleagues of Indy’s, and fill the gap left by Denholm Elliot (Marcus Brody, who isn’t in this movie due to Elliot’s death) wonderfully. Cate Blanchett, always wonderful, is great as the Russian baddie Irina Spalko. She’s menacing, and has an awesome accent. Blanchett is more or less unrecognizable under all the pale make-up. John Williams’ score is totally up to snuff; the classic Raiders March returns early on, and is played at perfect moments throughout the film. We get to hear the Indiana/Marion love theme again, and the new themes are great as well. His score really gets the blood pumping. The action scenes are incredible as they ever were. Each film in the series opens with a big set-piece (the temple in “Raiders,” the restaurant/chase scene in “Temple,” and the young Indy scene in “Crusade”) and those scenes are matched by an excellent opening in a certain warehouse in this film. There’s always a huge action scene ¾ of the way through, which in this film, is an epic car battle in the forest. It’s unbelievable, and Spielberg reminds us why he’s one of the best directors out there. Use of CGI is minimal and only seldom noticeable, which I am thankful for. It fits with the old films. There are numerous references to the original films in this installment, which helps it fit in with the series. The “creepy crawly” sequence in this movie is very chilling. “Crystal Skull” is the most enjoyable experience I’ve had at the movies all year. The joy of seeing my favorite hero back on the big screen is just phenomenal. As far as ranking the series, I personally think it’s a tie between “Raiders” and “Last Crusade” as the best, with Kingdom of the Crystal Skull following just behind. Temple of Doom is the worst, and feels less like an Indy film then “Crystal Skull,” though I still enjoy the film. “Crystal Skull” also ties the entire series together, filling in gaps between movies and bringing a close to some relationships. It makes for a great finale to the series, though if they make a fifth, I won’t object. If you like Indiana Jones, you will love this movie. I can’t imagine a fan of the series disliking this installment. For those skeptical about the age of Ford, just remember this line from Raiders: “It’s not the years, it’s the mileage.” Indiana has trekked many miles, and the ones trekked in “Crystal Skull” are as fun as any that have been traversed before.